We are all uniquely different, and react differently. So your emergency protocol may be different than any other MG patient. What do you do? You get informed. Talk to your neurologist and be sure both of you are aware of what mechanisms need to go into place should you “go in to crisis” The two of you should have an understanding of the protocol and come up with a plan together. Write up a brief explanation of your illness and all of your medi- cations and dosages. Your doctor’s name and contact numbers, MSP number, next-of-kin and advocate information. Make sev- eral copies – be sure to update this information, whenever there is any change. Keep a copy in a medical folder or on a file card. Put a copy on the fridge, in your glove compartment, your purse, wallet, briefcase, lap top bag, anything you might carry with you. 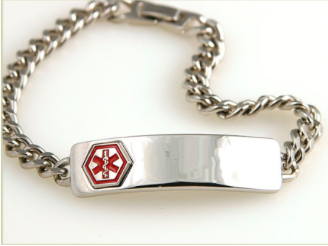 Get a MEDIC ALERT bracelet or medallion. It is a good idea to get in the habit of keeping a medication ‘di- ary’, listing what medications you’ve taken each day, in what strengths, and at what times. This is invaluable to any caregiver or emergency response person, should you not be able to speak for yourself. If you are feeling ‘off’ one day, make note of it. When it started, how it manifested? Do you have a fever, slow healing sore, nausea or vomiting? If you are having problems swallowing, placing your MESTINON under your tongue helps it absorb quickly and may bring relief. If you sit down and try to relax, do you feel better? When does it become serious? When nothing helps and you still feel lousy! If you are not able to swallow your medication or enough liquids to stay adequately hydrated this is a serious situation and requires you to go to Emergency. ●If you and your doctor feel you should go to Emergency, ask him or her to call ahead and let them know you are coming. ●If possible take your meds and whatever you need to swallow them, yoghurt, pudding etc. You won’t want to have to wait for the hospital to order them from the hospital pharmacy. Do not take any medications until you are seen by the ER doctor, in case it is the medication level itself that is the problem. ● Be sure the attending nurse and physician understand your condition. If you are unable to talk to them, be sure they read the paper. Be sure someone is aware of your present condition and watches to be sure are not getting worse as you may have to wait to be seen by ER staff. And while all of this is going on, DO NOT PANIC. It sounds simplistic but panic will only make your symptoms worse and could cloud the underlying MG issue that needs to be addressed.